The neurocranium encloses the brain, labyrinth, and middle ear. The outer and inner tables of the skull are connected by cancellous bone and marrow spaces (diploe). The bones of the roof of the cranium (calvaria) of adolescents and adults are rigidly connected by sutures and cartilage (synchondroses). 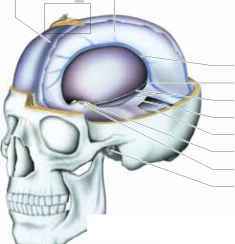 The coronal suture extends across the frontal third of the cranial roof. The sagittal suture lies in the midline, extending backward from the coronal suture and bifurcating over the occiput to form the lambdoid suture. The area of junction of the frontal, parietal, temporal, and sphenoid bones is called the pterion; below the pterion lies the bifurcation of the middle meningeal artery. The inner skull base forms the floor of the cranial cavity, which is divided into anterior, middle, and posterior cranial fossae. The anterior fossa lodges the olfactory tracts and the basal surface of the frontal lobes; the middle fossa, the basal surface of the temporal lobes, hypothalamus, and pituitary gland; the posterior fossa, the cerebellum, pons, and medulla. The anterior and middle fossae are demarcated from each other laterally by the posterior edge of the (lesser) wing of the sphenoid bone, and medially by the jugum sphenoidale. The middle and posterior fossae are demarcated from each other laterally by the upper rim of the petrous pyramid, and medially by the dorsum sellae. The layers of the scalp are the skin (including epidermis, dermis, and hair), the subcuticular connective tissue, the fascial galea aponeurotica, subaponeurotic loose connective tissue, and the cranial periosteum (pericranium). The hair of the scalp grows approximately 1 cm per month. The connection between the galea and the pericranium is mobile except at the upper rim of the orbits, the zygomatic arches, and the external occipital protuberance. Scalp injuries superficial to the galea do not cause large hematomas, and the skin edges usually remain approximated. Wounds involving the galea may gape; scalping injuries are those in which the galea is torn away from the periosteum. Subgaleal hemorrhages spread over the surface of the skull. The viscerocranium comprises the bones of the orbit, nose, and paranasal sinuses. The superior margin of the orbit is formed by the frontal bone, its inferior margin by the maxilla and zy-gomatic bone. The frontal sinus lies superior to the roof of the orbit, the maxillary sinus inferior to its floor. The nasal cavity extends from the anterior openings of the nose (nostrils) to its posterior openings (choanae) and communicates with the paranasal sinuses—maxillary, frontal, sphenoid, and ethmoid. The infraorbital canal, which transmits the infraorbital vessels and nerve, is located in the superior (orbital) wall of the maxillary sinus. The portion of the sphenoid bone covering the sphenoid sinus forms, on its outer surface, the bony margins of the optic canals, prechiasmatic sulci, and pituitary fossa. The meninges lie immediately deep to the inner surface of the skull and constitute the membranous covering of the brain. The pericranium of the inner surface of the skull and the dura mater are collectively termed the pachymen-inges, while the pia mater and arachnoid membrane are the leptomeninges. The pericranium contains the meningeal arteries, which supply both the dura mater and the bone marrow of the cranial vault. The pericranium is fused to the dura mater, except where they separate to form the dural venous sinuses. The virtual space between the pericranium and the dura mater—the epidural space—may be forced apart by a pathological process, such as an epidural hematoma. Immediately beneath the dura mater, but not fused to it, is the arachnoid membrane; the intervening virtual space—the subdural space—contains capillaries and transmits bridging veins, which, if injured, can give rise to a subdural hematoma. The falx cerebri separates the two cerebral hemispheres and is bordered above and below by the superior and inferior sagittal sinuses. It attaches anteriorly to the crista galli, and bifurcates posteriorly to form the tentorium cerebelli, with the straight sinus occupying the space between the falx and the two halves of the tentorium. The much smaller falx cerebelli separates the two cerebellar hemispheres; it encloses the occipital sinus and is attached posteriorly to the occipital bone. The tentorium cerebelli separates the superior aspect of the cerebellum from the inferior aspect of the occipital lobe. It rises toward the midline, taking the shape of a tent. The opening between the two halves of the tentorium, known as the tentorial notch or incisura, is traversed by the midbrain; the medial edge of the tentorium is adjacent to the midbrain on either side. 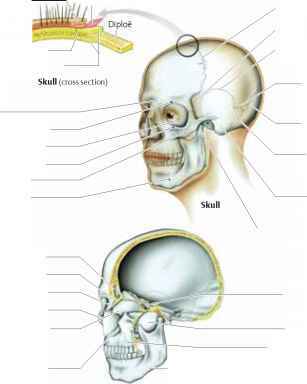 The tentorium attaches posteriorly to the sulcus of the transverse sinus, laterally to the superior rim of the pyramid of the temporal bone, and anteriorly to the anterior and posterior clinoid processes. The tentorium divides the cranial cavity into the supratentorial and in-fratentorial spaces. The pituitary stalk, or infundibulum, accompanied by its enveloping arachnoid membrane, passes through an aperture in the posterior portion of the diaphragma sellae (diaphragm of the sella turcica), a horizontal sheet of dura mater lying between the anterior and posterior clinoid processes. The pituitary gland itself sits in the sella turcica, below the diaphragm. The meningeal branches of the three divisions of the trigeminal nerve (pp.28 and 94) provide sensory innervation to the dura mater of the cranial roof, anterior cranial fossa, and middle cranial fossa. The meningeal branch of the vagus nerve (p. 29), which arises from its superior ganglion, provides sensory innervation to the dura mater of the posterior fossa. Pain can thus be felt in response to noxious stimulation of the dura mater, while the cerebral parenchyma is insensitive. Some of the cranial nerves, and some of the blood vessels that supply the brain, traverse the dura at a distance from their entry into the skull, and thereby possess an intracranial ex-tradural segment, of a characteristic length for each structure. Thus the rootlets of the trigemi-nal nerve, for instance, can be approached surgically without incising the dura mater. The cranial pia mater is closely apposed to the brain surface and follows all of its gyri and sulci. The cerebral blood vessels enter the brain from its surface by perforating the pia mater. Except for the capillaries, all such vessels are accompanied for a short distance by a pial sheath, and thereafter by a glial membrane that separates them from the neuropil. The perivascular space enclosed by this membrane (Virchow-Robin space) contains cerebrospinal fluid. The choroid plexus of the cerebral ventricles, which secretes the cerebrospinal fluid, is formed by an infolding of pial blood vessels (tela choroidea) covered by a layer of ventricular epithelium (ependyma). The dura mater is closely apposed to the arachnoid membrane; the virtual space between them (subdural space) contains capillaries and bridging veins. Between the arachnoid membrane and the pia mater lies the sub-arachnoid space, which is filled with cerebrospi-nal fluid and is spanned by a network of delicate trabecular fibers. The fluid-filled cerebral ventricles constitute the inner CSFspace. Each of the two lateral ventricles communicates with the third ventricle through the interventricular foramen of Monro (one on each side). Fluid passes from the third ventricle through the cerebral aqueduct (of Sylvius) into the fourth ventricle, and thence through the single midline foramen (of Magendie) and paired lateral foramina(of Luschka) into the subarachnoid space (outerCSFspace). 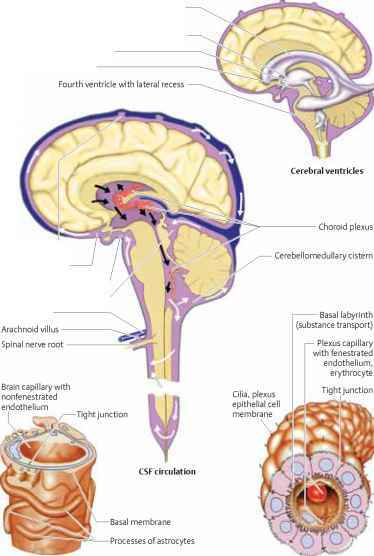 Dilatationsofthe subarachnoid space are called cisterns. The cerebellomedullary cistern (cisterna magna) lies between the posterior surface of the medulla and the undersurface of the cerebellum. The cerebellopontine cistern occupies the cerebellopontine angle. The ambient cistern lies lateral to the cerebral peduncle and contains the posterior cerebralandsuperior cerebellar arteries, the basal vein, and the trochlear nerve. The interpeduncular cistern lies in the midline between the cerebral pedunclesand contains the oculomotor nerves, the bifurcation of the basilar artery, and the origins of the superior cerebellar and posterior cerebral arteries; anterior to it is the chiasmatic cistern, which surrounds the optic chiasm and the pituitary stalk. The portion of the subarachnoid space extending from the foramen magnum to the dorsum sellae is collectively termed the posterior cistern. The CSF, a clear and colorlessultrafiltrate of blood plasma, is mainly produced in the choroid plexus of the cerebral ventricles and in the capillaries of the brain. It normally contains no red blood cells and at most 4 white blood cells/^l. Its functions are both physical (compensation for volume changes, buffering and equal distribution of intracranial pressure despite variation in venous and arterial blood pressure) and metabolic (transport of nutrients and hormones into the brain, and of waste products out of it). The total CSF volume in the adult is ca. 150 ml, of which ca. 30 ml is in the spinal subarachnoid space. Some 500 ml of cerebrospinal fluid is produced per day, corresponding to a flow of ca. 20 ml/h. The normal pulsation of CSF reflects brain pulsation due to changes in cerebral venous and arterial volume, respiration, and head movements. AVal-salva maneuver increases the CSF pressure. CSF circulation. CSF formed in the choroid plexus flows through the ventricular system and through the foramina of Magendie and Luschka into the basal cisterns. It then circulates further into the spinal subarachnoid space, over the surfaces of the cerebellum and cerebrum, eventually reaching the sites of CSF absorption. It is mainly absorbed through the arachnoid villi (arachnoid granulations, pacchionian corpuscles), which are most abundant along the superior sagittal sinus but are also found at spinal levels. CSF drains through the arachnoid villi in one direction, from the subarachnoid space to the venous compartment, by a valve mechanism. This so-called bulk flow is apparently achieved with the aid of pinocy-totic vacuoles that transport the CSF, and all substances dissolved in it, in ladlelike fashion. At the same time, CSF diffuses into the brain tissue adjacent to the CSF space and is absorbed by the capillaries. These "barriers" are not to be conceived of as impenetrable; under normal conditions, all plasma proteins pass into the CSF. The larger the protein molecule, however, the longer it takes to reach the CSF, and the steeper the plasma/CSF concentration gradient. The term blood-brain barrier (BBB) is a collective term for all barriers lying between the plasma and the neuropil, one of which is the blood-CSFbarrier (BCB). Disease processes often alter the permeability of the BBB, but very rarely that of the BCB. Morphologically, the BCB is formed by the choroid epithelium, while the BBB is formed by the tight junction (zonula occludens) of capillary endothelial cells. Up to half of all cerebral capillaries have a tubular structure, i.e., they have no connecting interstices. Physiologically, the system of barriers enables the regulation of the osmolarity of brain tissue and CSF and, thereby, the intracranial pressure and volume. Biochemically, the BCB is permeable to water-soluble substances (e. g., plasma proteins) but not to lipo-soluble substances such as anesthetics, psychoactive drugs, and analgesics. The BBB, on the other hand, is generally permeable to liposoluble substances (of molecular weight less than 500 daltons) but not to water-soluble substances. Where is the left ventral root nervous system? What is sella turcica bone? What is endoneurial capillary wall? What are the fibers on a capillary tissue? What is endplate fatty marrow replacement? 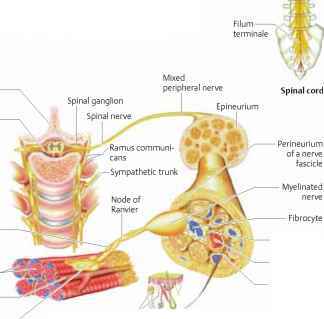 Where does central nerve end and peripheral nerve start? Where is the falx in the brain? What is sclerosis consistent with surface of galea? Where is dorsum sella brain? Where is the inner skull superior midline? What is, & what are the effects of CSF into the superior of sella turcica? What bone is the sella turcica attached to? Is the sella in a cerebral ventricle?